Designed to complement the Resin Chairs, colorful Resin Tables provide a versatile and fun space for work or play. 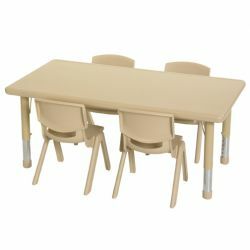 Available in a variety of shapes to create an ideal group learning environment, tables are easy to clean and sanitize between science experiments and snack time. Tables feature a sturdy, reinforced steel frame and fade-resistant polyethylene surface that will not crack, chip or peel. Legs adjust in 1"increments from 13.25" to 22.25".